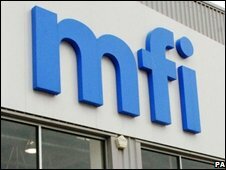 Furniture retailer MFI has gone into administration - citing falling demand for big ticket items, cash-flow problems and the withdrawal of credit. Some stores will continue to trade, but 26 will close. Existing orders will be either met or refunded, MFI said. The GMB union had warned this was likely unless the firm's store landlords agreed to a rent-free period. MFI's administrators told the BBC they had received two expressions of interest from potential buyers. The firm, subject of a management buy-out in September, has 110 stores and a workforce of more than 1,000 people. Analysts said that the downturn of the housing market was a major contributor to MFI's decline, people stopped buying things such as new bathrooms and kitchens. MCR have been appointed as administrators, who will work to maximise returns to creditors. "Whilst a decision has not been made as to an appropriate exit route and the future of the company, the administrators will be reviewing the possibility of a sale of some or all of the Company's stores," said MCR's Phil Duffy. All outstanding employee wages have been paid up to date and ongoing wages for retained staff will continue to be paid he added. MFI has seen sales fall in recent years as it has faced increased competition from newer rivals such as Ikea. The management buy-out bought MFI from its previous owner, private equity group Merchant Equity Partners (MEP). MEP bought the retail business for £1 in 2006 from the former MFI company, which renamed itself Galiform and maintained ownership of the manufacturing arm. The GMB union said that MFI employees would not have been surprised at the development, saying the firm had been "badly managed for some years". But the union's Yorkshire regional secretary Tim Roache said is was "disappointing that the landlords of the shops pulled the plug and did not give the management time to turn it around".